THE HEART OF THE KEYSTOKER is a simple feed mechanism with very few moving parts which can easily be adjusted and maintained by the average householder. Troublesome belts, sheer pins and worm conveyors have been eliminated. 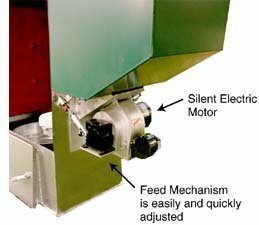 This feed mechanism with slow moving, long life parts keeps service calls to a minimum. COMFORTABLE WARMTH, KEYSTOKER winter conditions your home with clean even heat. Accurate controls and thermostat provide automatic well-regulated warmth with quick response to weather changes. 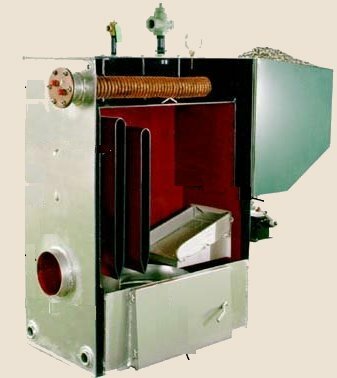 Warm air, water or steam heat are equally efficient with the KEYSTOKER unit. ABUNDANT HOT WATER is available -- 200 gallons or more, every hour of every day. This year round plentiful supply is made possible by the use of copper coils that heat your water in a jiffy. No hot water tank to install. 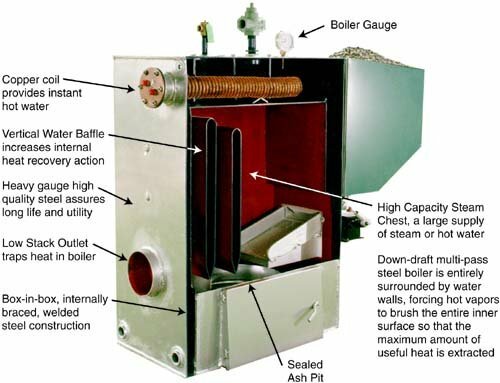 LOW COST FUEL, KEYSTOKER is most economical and efficient using anthracite rice or buckwheat coal. The savings on fuel bills alone will pay for your Keystoker in the course of time.